There are few hot hatches as eagerly awaited as the new Fiesta ST, and Ford has now confirmed the tech that will make it the most dynamic ST yet. While prices won't be announced until closer to the April on-sale date, we expect it to start at around £20,000. It's been six years since the last Ford Fiesta ST was released. The updated model brings with it a lot of tech and a lot of power, but also offers far better levels of refinement. The new model will come with an optional Quaife limited-slip differential (LSD) for enhanced cornering grip, which works to limit distribution of torque to reduce wheel spin. The new LSD option works alongside Ford's Torque Vectoring Control technology, which reduces understeer when cornering. Ford-patented force vectoring springs will also make their first appearance, working to make the car responsive and improve ride comfort. Optional Launch control should make it easier for drivers to hit the claimed 6.5 seconds it takes to reach 62mph from a standstill. The control instructs the system to build engine rpm and automatically hold at the rev limit – filling an on-screen gauge that indicates when the car is prepared to go. In 2017, Ford revealed the new Fiesta ST would, for the first time, feature selectable Drive Modes - Normal, Sport and Track. Powering the new car is an all-new three-cylinder, 1.5-litre EcoBoost petrol engine producing 200PS and 290Nm of torque. 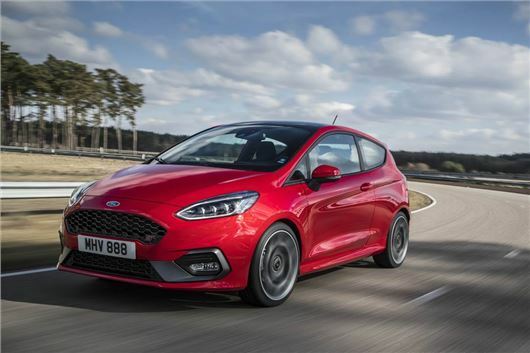 Available in both three-door and five-door bodystyles with sporty ST exterior styling and standard 17-inch or optional 18-inch alloy wheels, the all-new Fiesta ST will offer buyers a choice of ST-1, ST-2 and ST-3 equipment levels. A standard SYNC 3 communications and entertainment system will enable Fiesta ST drivers to control audio, navigation and connected smartphones using voice commands. A high quality B&O PLAY Sound System is also offered. Standard driver assistance technologies include Lane Keeping Aid, Lane Keeping Alert and cruise control with adjustable speed limiter, while features including rain-sensing wipers, automatic headlamps, auto-highbeam and Traffic Sign Recognition also are available.